Sitting, the début play written by comic Katherine Parkinson, known for her turns on the IT Crowd and Humans, as well as her current role in Home, I’m Darling, for which she has been nominated for an Olivier. The show sees three characters sit for an unseen portrait painter, John, in different timelines, and weaves their lives into a poignant story through their conversations with John. The device is a clever one, difficult to pull off, and it mostly works. Luke is certainly the standout character, in part due to Weinman’s excellent comic timing and easy tone, and also due to the fact that Parkinson gives him all the best lines. From his monologue, at least, it is clear Parkinson has great comedic writing chops, and Luke’s quips and slips, from immediately getting his kit off to wondering what someone who sits for a portrait is called (‘a settee?’) elicit some proper belly laughs. There is certainly more potential in the character of Cassandra, though, in both the writing and acting departments – there is big joke potential in the character of a young, vapid, moneyed actress, but the caricature isn’t fully fleshed out, and so the humour limelight is effectively stolen. Similarly, painter John's relationship with Mary (Hayley Jayne Standing) seems hazy, and her story leaves questions unanswered. For this, we develop a far less intense emotional bond to Cassandra and to Mary than to Luke. The humour leads well into the pathos of the last twenty minutes or so of the play, where the strands of the plot intertwine to paint a rather sad picture. Director Sarah Bedi gets kudos here for managing to elicit catharsis in a play that is essentially made up of three monologues by people sat in chairs, and a final set reveal pushes the play into emotionally satisfying territory, but for Mary and Cassandra, at least, their theatrical portraits aren’t quite finished. 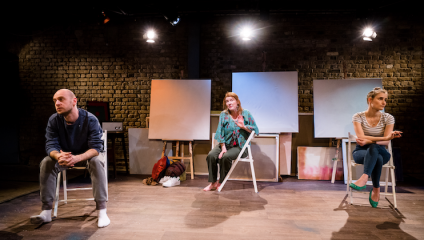 Sitting is at the Arcola until 30 April.